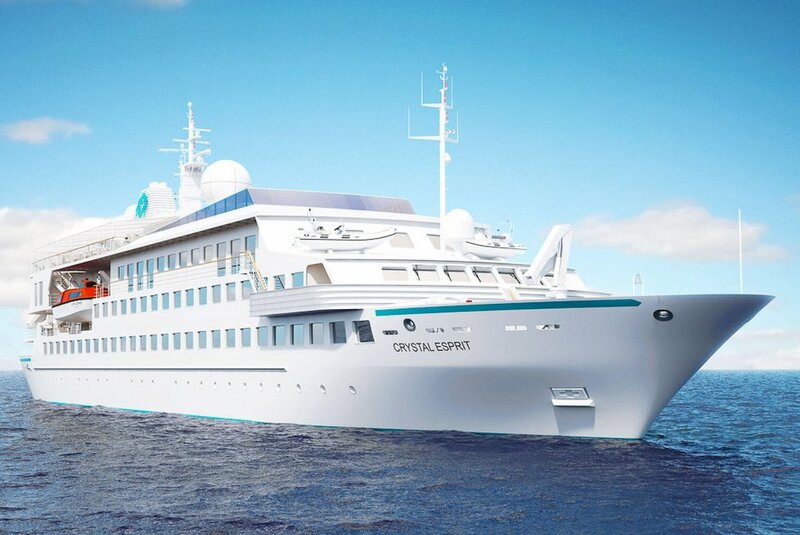 Crystal Cruises launched its newest yacht, the 62-passenger Crystal Esprit, in the Seychelles on Sunday (December 20). The debut of Esprit marks a milestone for the line - it expands from its longtime fleet of two luxury cruise vessels into the world of yachting (and to river cruising 2016). The christening ceremony took place at Eden Island Marina in Mahé, Victoria. It was attended by travel partners, local dignitaries, and executives from the new parent company of Crystal, Genting Hong Kong (GHK). The godmother of Crystal Esprit, Lady Gaenor Anne Meakes, is a fiancée of Mark Richards, an 8-time champion skipper of the Sydney-to-Hobart 628-mile yacht race. She christened the ship by breaking a bottle of 2004 Louis Roederer, Cristal Brut against the hull. An elaborate fireworks display closed the evening. "Since joining Crystal just over two years ago, a personal goal of mine has been to see Crystal realize the next step in continuing to pioneer luxury travel and hospitality; and today I am seeing that dream fulfilled." The majority of vacationers booked on the soldout voyage are new to Crystal Cruises. The maiden voyage of Esprit is a 7-night cruise around the Seychelles islands. It is followed by a 2-night land program in Dubai, just in time for the New Year's Eve. The inaugural season of Crystal Esprit will feature itineraries in Holy Land and Middle East, the Mediterranean and Adriatic Coast, the Seychelles and Indian Ocean. Complimentary adventure tours are available in ports of call, as well as more boutique, extra-fee excursions. The all-suite yacht will offer multiple dining venues (main dining room, outdoor café, self-serve snack spot, grill and 24-hour room service), a couple of bars, an aft marina with complimentary jet skis, kayaks, fishing and snorkeling equipment. Bicycles are available for guest use in port. Crystal Esprit also carries a small submarine for 30-minute rides to 2 passengers at a time for $599 per person.